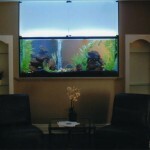 Serenity Spa has been using Aquarium Effects as our service provider for the past 2 years and could not be any happier. Aquarium Effects is a very professional, reliable and also very knowledgeable service provider. Our clients are continuously complimenting us on our 220 gallon displays cleanliness and beauty. Needless to say, I highly recommend them! Clarence at Aquarium Effects has been maintaining the aquarium in our inpatient unit for approximately 8 months. His service has been outstanding and the tank has never looked better. He is reliable conscientious and always up before he leaves. I would have no difficulty giving him a reference to anyone that requires his service. I’m so glad we have someone like Clarence a Aquarium effects taking care of our saltwater aquarium. Clarence is a very friendly and trustworthy person. He takes his time to do his job well and the fish always look very happy and healthy. I am the owner of a small animal veterinary clinic in Oakville, I had always wanted to have an aquarium in the reception area of our clinic. I thought it would help soothe the owners concerned about their animals. I also felt that it would have a good calming effect on the staff in general. The problem was that I knew nothing about setting up the aquarium and also had no time to maintain it. Clarence came to our reception area to assess the space and help me determine what size and style would suit the best. He also helped me decide which fish would be the best for the tank we were deciding on as well. He took care of everything! Clarence set up the aquarium with the filtration and also decorate it beautifully. 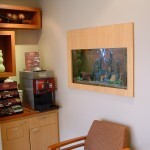 We recently renovated our dental office and decided to place our fish tank in the wall, instead of artwork. 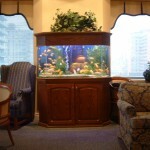 Aquarium Effects provided us with their expertise in redesigning the aquarium. They helped with the fish choice, set up and decorating. Clarence then set us up on a regular service schedule in order to maintain the beauty of the tank. The result is a beautiful, modern, and soothing aquarium that all of our staff and patients (both adult and children) love. 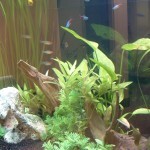 We have found aquarium effects to be very punctual, highly dependable, helpful and friendly. 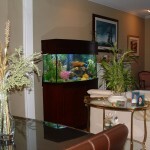 We would highly recommend Clarence and Aquarium Effects for anyone’s home or office aquarium.